Not to be confused with Spunge. Sponge is an American alternative rock band from Detroit, Michigan formed in 1991 by Vinnie Dombroski, Mike Cross, Tim Cross, Jimmy Paluzzi, and Joey Mazzola. Dombroski and the Cross brothers were founding members of the hard rock band Loudhouse, later joined by Mazzola at the end of the band's tenure. Sponge was signed to Sony Records in 1994 but has since switched to other labels. Vinnie Dombroski, Tim Cross, and Mike Cross were in a band called Loudhouse, fronted by vocalist Kenny Mugwump. After releasing only one album and having a song appear on the soundtrack to the 1991 film Point Break, the band added guitarist Joey Mazzola. After Mugwump decided to pursue a career in acting and directing, Dombroski switched from drums to vocals, and they recruited Jimmy Paluzzi to round out the lineup. The band then decided to start fresh and name themselves Sponge. Their debut album, Rotting Piñata, released in 1994, was a major hit, received heavy play on radio and MTV, and was certified gold by the RIAA. The two biggest singles from that album were "Plowed" and "Molly". By the end of 1994 Charlie Grover had replaced drummer Paluzzi. Their follow-up album was called Wax Ecstatic; the track "Have You Seen Mary" was included in the Kevin Smith film Chasing Amy. The title track also received significant airplay. On June 28, 1996, Sponge opened for the Kiss reunion tour. The band had been hired a few weeks earlier to replace the Stone Temple Pilots, who had cancelled their opening performance due to Scott Weiland's drug problems. The show was one of the last concerts held at Tiger Stadium in Detroit. New Pop Sunday, on Beyond Records, was a departure from the grittier sound of the first two albums, featuring songs that were pop rock in nature. 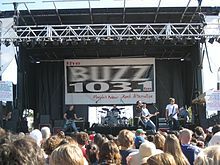 The band's popularity waned sharply during this period; however, "Live Here Without You" was nominated for the Outstanding National Single award by the Detroit Music Awards in 2000. During that time, the Cross brothers and Charlie Grover left Sponge. The remaining members (Mazzola and Dombroski) recruited Robby Graham on bass and rehired Paluzzi for drums to play sporadic shows over a short period of time. In 2001, Dombroski joined the Seattle side project Spys4Darwin, which recorded one EP and worked together into the following year. Dombroski and Mazzola then created a new solidified lineup consisting of drummer Billy Adams, guitarist Kurt Marschke, and bassist Tim Krukowski. Sponge continued their career with For All the Drugs in the World on Idol Records in 2003. Afterwards, Dombroski created a new lineup once again, this time without the other founding member Mazzola, replaced by Andy Patalan, while Kyle Neely replaced Marschke. Dombroski became the only remaining original member of Sponge; although, Adams and Krukowski from the previous album stayed. The Man was released through traditional channels on Idol Records. After exclusively selling the promo release Hard to Keep My Cool at shows, it was announced in November 2007 that the band would release a new album, titled Galore Galore, on their newly signed label Bellum Records. It contained songs from the promo plus new tracks. The album was quickly released on December 4, 2007 (the release date varied depending on the outlets that supplied the album). In 2009, former Sponge producer Tim Patalan replaced Krukowski on bass, and the following year the band released the EP Destroy the Boy. All of the songs from this release would round out the next studio album by the band in 2013, Stop the Bleeding. The band's latest album, The Beer Sessions, was released on October 8, 2016 through a campaign on Pledgemusic. In May 2018, at the annual Detroit Music Awards, the original lineup of Vinnie Dombroski, Tim Cross, Jimmy Paluzzi, Mike Cross, and Joey Mazzola reunited for one night only. This was the first time in 24 years that all of the members shared the stage. "Molly (16 Candles Down the Drain)"
"Wax Ecstatic (To Sell Angelina)"
^ "Detroit Free Press". freep.com. ^ "Sponge Chart History (Billboard 200)". Billboard. Eldridge Industries. Retrieved October 9, 2018. ^ "Sponge Chart History (Heatseekers Albums)". Billboard. Eldridge Industries. Retrieved October 9, 2018. ^ "Sponge Chart History (Hot 100)". Billboard. Eldridge Industries. Retrieved October 9, 2018. ^ "Sponge Chart History (Alternative Songs)". Billboard. Eldridge Industries. Retrieved October 9, 2018. ^ "Sponge Chart History (Mainstream Rock)". Billboard. Eldridge Industries. Retrieved October 9, 2018. Huey, Steve. "Sponge[dead link]". AllMusic. This page was last edited on 18 March 2019, at 14:22 (UTC).